What about some of the older S.American Columbus definitive issues? I am surprised that none of those old, dusty Christopher Columbians have not made an appearance yet. Chile is a good South American place to start. Five denominations of this lithographed design were issued in 1867 (Scott 15-19). They are all unwatermarked and perforated 12. It just so happens that the first 14 stamps issued by Chile all depict Christopher Columbus, also. As with most stamps issued between 1853 through 1865, many variations and errors exist. Almost all of them have hefty catalog values. This is basically the fifth design that Chile used for their stamps. This gray 20-centavos Columbus stamp was issued in 1900 along with five other denominations (Scott 39-43 and 45). Chile did not start issuing stamps without Christopher's picture until 1904. In 1901 Chile issued six stamps (Scott 51-56) where Christopher Columbus found a razor. He is now clean shaven and now has teeth -- that is, the stamps are no longer rouletted but perforated. In this case, perforated 12. In 1904 Chile finally issued stamps with a picture of someone or something other than Christopher Columbus. 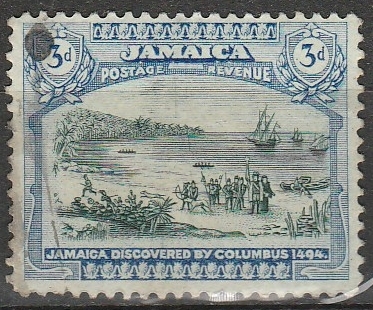 They used two designs that year on ten stamps (Scott 58-67). It was their Coat of Arms and a fellow named Pedro de Valdivia. It just so happened that these were telegraph stamps that were overprinted in order to be used as postage. I reckon they ran out of their regular supply of Christopher Columbus stamps. That didn't last long, 'cause by the next year three more Christophers appeared. The ultramarine five-centavos seen above is the design used on the one, two, three, and of course five-centavos stamps (Scott 68-71). Chris seems to have mellowed (a softer, kinder-looking feller) since his first depiction on a Chile stamp. This gray and black ten-centavos is the second Columbus design of the 1905 issue. It appears on the next five denominations (12 through 50-centavos) stamps (Scott 72-77). The third design of this issue is a larger stamp (Scott 78) and is the high value one-peso stamp. Sorry, I do not have a scan (nor a stamp to scan) of it. Notice how Columbus has gained a little weight over the years. I kinda know how that goes. It is interesting to note that between 1853 through 1909, except for the telegraph stamp year of 1904, Chile depicted only Christopher Columbus on their stamps. Except for a few variations that I don't have I've shown most of them in the previous posts. During 1910 they issued a couple of overprinted Columbus stamps, but also celebrated the Century of Independence by issuing fifteen pictorial stamps in commemoration. None showing Christopher Columbus. In 1911 they issued fifteen engraved portrait definitives. The first one depicts our hero. Chile ran with the 1911 portrait designed stamps (Scott 98-112) for all they were worth. From 1912 through 1930 they used the same design with various perforations, colors, printing methods, overprints, and watermarks. But the era of having only Christopher Columbus on their stamps was over. Found this in my collection. In 1992 the Europa stamps of Spanish Andorra showed the Santa Maria and an engraving made from a map sent to Spain by Columbus. 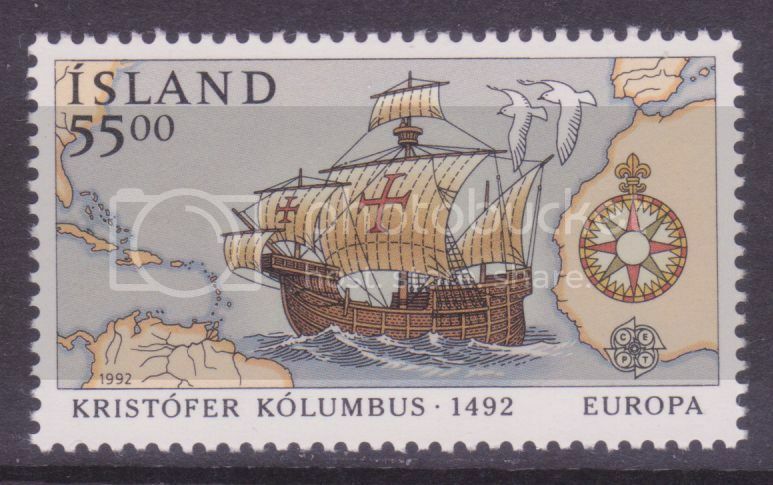 In 1992, the 500th anniversary of Columbus's first voyage, Iceland issued a set of two stamps, the second of which - SG 786 - shows his ship the Santa Maria. The other stamp - which I have posted in the Vikings thread - commemorates Leif Eiriksson's voyage to Vinland (in Newfoundland) about five centuries earlier. 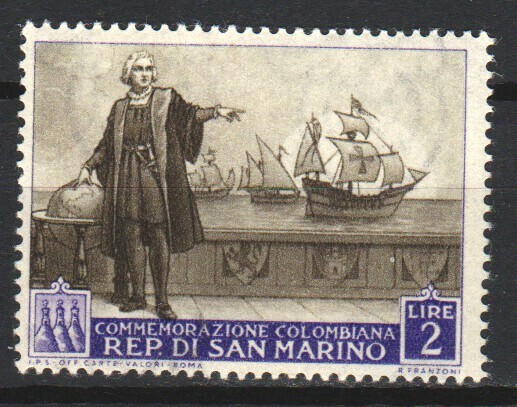 In 1952, slightly late, San Marino issued a set of stamps for the quincentenary of the birth of Columbus in 1451. Here is one of them. 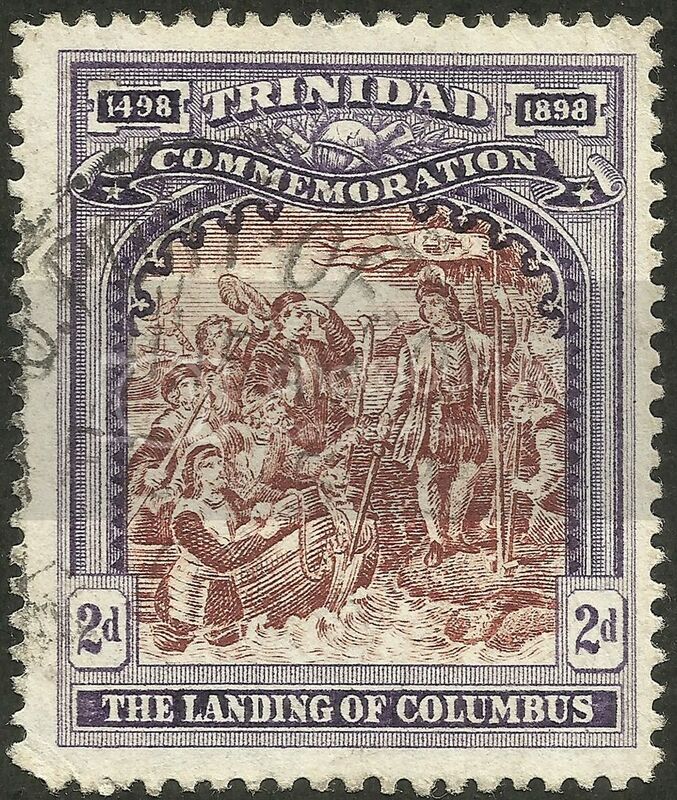 Trinidad, Scott #91, commemorating the 400th anniversary of Columbus' landing on the island in 1498. 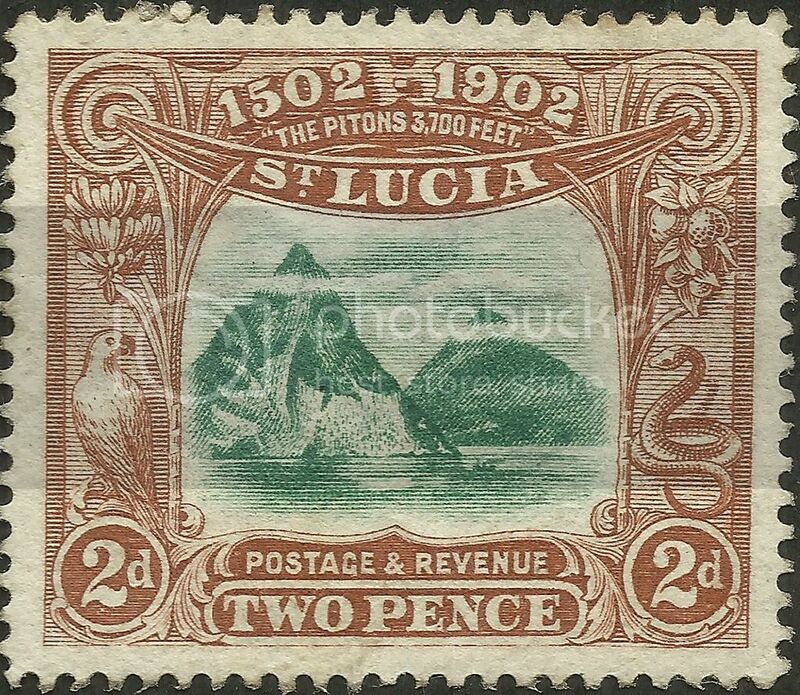 While not actually picturing Columbus or his ships, St. Lucia Scott #49, marks his first landing there in 1502. 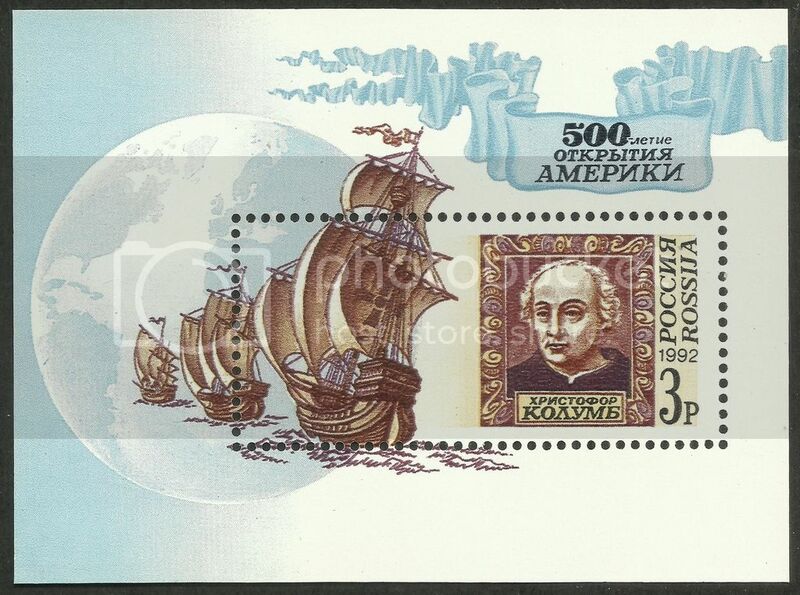 Russia Scott #6075, issued in 1992 for the 500th anniversary of the "discovery" of the Americas. There actually is a boat pictured in the stamp. On the left peak, if you follow the downward slope at right into the water, you will see a very small boat. It's not that clear in your pic, but on stamps with a finer impression, the boat is clearly there. 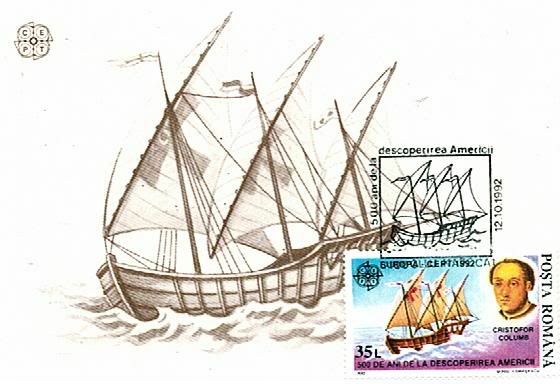 I don't know the original illustration for which the stamp design is based, so I cannot confirm, but I had sort of assumed that it was one of Columbus' small landing craft. However, I have cannot prove it nor can I provide a good reason for that assumption. Nice stamp, thanks for posting the pic!